You can certainly make do with only one sliding bevel, but in some larger projects you may be laying out several different angles throughout, and it is beneficial to set a separate sliding bevel to each angle and not alter them for the duration of the project. When buying a sliding bevel, make sure the locking system works properly, make sure it locks down tight enough to stop the stock and beam from moving. The tightening mechanism can vary depending on the make, some have wingnuts which can protrude out and get in the way during layout. Some are tightened using a simple setscrew which lies flush with the surface, however this does mean you need a screwdriver to hand which can be a nuisance. The main advantage though is the guaranteed security this gives to the sliding bevel. Other mechanisms have cam lock-downs which also work well generally. The Bacho ones seem to be very disappointing in the way that they do not hold the beam tightly meaning that they move during use and therefore cannot guarantee retaining the exact same angle. This is due to the levers not tightening as much as they should so they leave the beam marginally loose. This was tested on both types of fastenings. Paul recommends considering the modern makers when buying a sliding bevel as the fastening techniques might have improved so it is worth trying these. He suggests getting one with a lever cam or a lever bar as this gives you extra leverage. He found the Stanley sliding bevel has worked well for decades and you can get this new for £15. 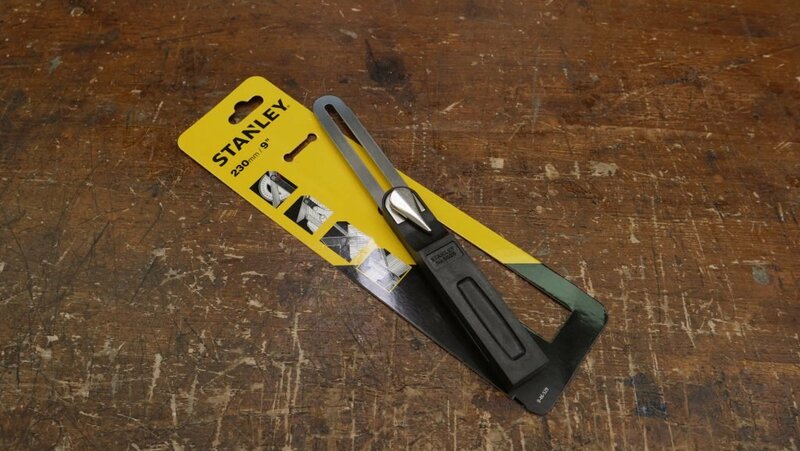 We purchased this Stanley Tools 5025 Sliding Bevel 230mm (9″) from eBay for £14.98* with free delivery. If you are ordering from the US, we recommend this one from Amazon. Please note Paul has not purchased this, however it seems to fit his recommended criteria. For what it’s worth I purchased a Veritas sliding bevel years ago wanting the lever lock style, as well as for the company’s great reputation. Much to my chagrin the lever assembly would not hold well and would slip at the most inconvenient time. The Veritas bevel was not an inexpensive tool. Before going to the trouble to return the tool I disassembled the locking mechanism and found the problem was the insert was only a friction fit in the stock that did not hold well. I carefully removed the insert without damaging the stock and found the insert had ribs that were suppose to hold it in place. I used epoxy to glue the insert securely in the stock making sure no epoxy clogged the internal threads. This repair did the trick and it remains one of my favorite tools, right up there with my inexpensive vintage #18 Stanley bevel. Just goes to show how even premium makers can have problems. Of course Lee Valley would have happily taken the tool back but I just did not want to go through the hassle to return it. Unfortunately, Veritas no longer offers this sliding bevel. It really is a nice tool. I purchased this one two and half years ago and it holds well. Same price range as the Stanley. I think the Stanley looks nicer. Thanks for letting us know about your sliding bevel, it is always useful to get product feedback. I received an email from Lee Valley stating that they will be reintroducing their sliding bevels this year!